Cat Ballou is a comedic western in the vein of Paint Your Wagon, but with fewer musical numbers. Not that there isn’t music, it’s just that Cat Ballou’s music comes in the form of Nat ‘King’ Cole and Stubby Kaye singing a ballad describing the tale as it unfolds. The tale that unfolds revolves around Catherine Ballou (Jane Fonda). We first meet her as she’s working on a white dress behind bars. She’s in prison, waiting for her hanging. The movie is the story of how she got where she is. 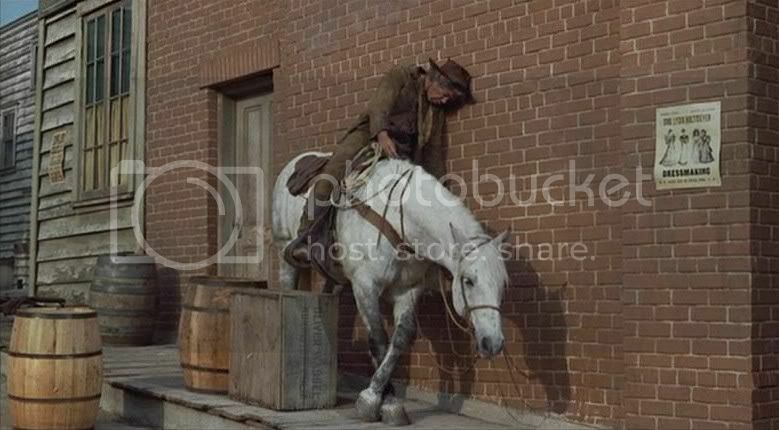 Cat Ballou started out as a fledgling school teacher, but on the train home to her father’s farm she has a run-in with a man under arrest, and the Bible-thumping, drunk preacher about to break him out of imprisonment. She believes she will have no need to ever again give them her attention. If she was right, there would be no movie. As it is, her father’s farm is in trouble. Some wealthy, powerful person wants his land, and has hired a notorious gunslinger to attain it. 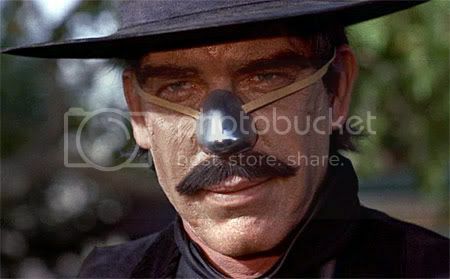 The gunslinger, Strawn (Lee Marvin), is best known for dressing in black and wearing a silver nose. The feisty side of Cat Ballou surfaces when her father is murdered and she discovers that the sheriff and the entire town are on the bad guys’ payroll. Thanks to a second, more fortuitous encounter with the vagrants she met on the train, she soon hires them as protection. One of them, Clay Boone (Michael Callan), has a desire to get “closer” to her, and doesn’t mind helping her out along the way. They suggest she hire the gunslinging skills of Kid Sheelen (Marvin again). She sends off for him, but is dismayed to discover he is a fall-down drunk. However, when he has just the right amount of whiskey in him he is superb, capable of shooting anything, anywhere. A little more whiskey, however, and he’s falling down again. Together the gang decides to go on the run, forced to rob trains in order to save the farm. Or something like that. It becomes harder to maintain a clear perspective of the plot as the film itself seems to stop caring after a while. The movie starts out being rather silly, and continues to get sillier and sillier. The main attraction of the movie is the cast. Fonda is rather attractive, demanding attention when she’s on screen, even if her acting here is as campy as the film. It’s remarkable how much she resembled her father when she gets mad. Marvin is also quite good, even winning an Oscar for his role. Most of the time he’s sloppy and drunk, but he hams up the part with relish. 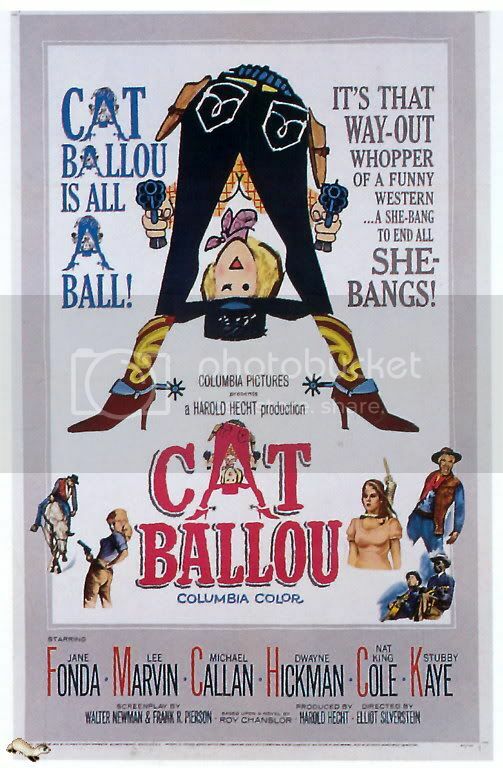 Cat Ballou is not your standard western, falling more into the comedy/musical western genre. The shoot-outs are generally not terribly exciting, and, as mentioned above, the entire film is rather silly. It’s not without its charms, however, especially if you are fans of the cast. Those not interested in westerns or the cast might want to spend their time with another film. This entry was posted in 2 pirate flags, 2.5 stars, C, Movie Reviews on December 31, 2009 by Tim Irwin.